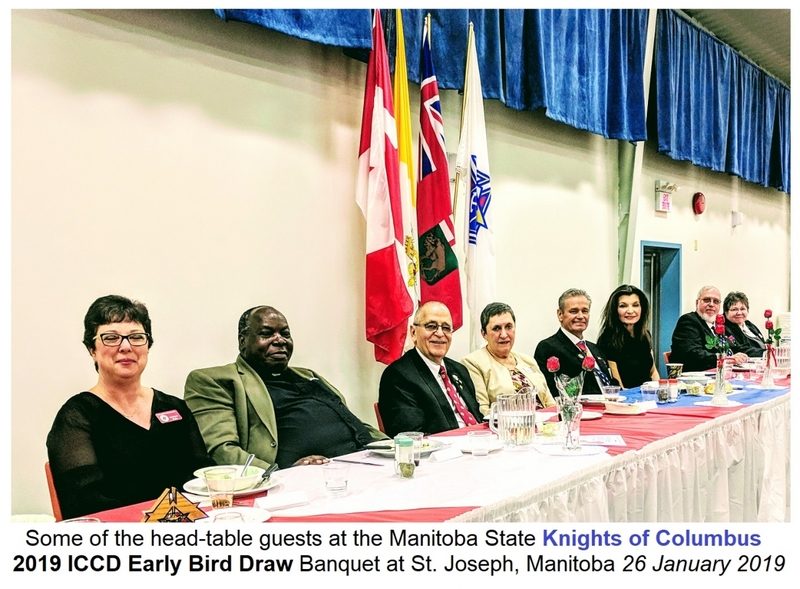 The Manitoba State Council of the Knights of Columbus and many more Knights and their spouses made their way to Saint-Joseph, a town near the U.S. border, for the 2019 annual ICCD "early Bird Draw". 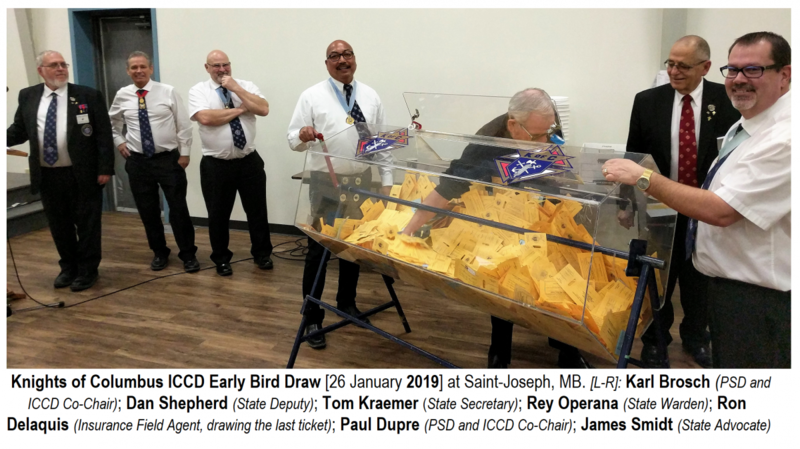 The ICCD - Inter-Council Charity Draw is one of the major fundraising efforts in which all councils across the province of Manitoba have the opportunity to participate. You will have seen the Knights from different councils at your local shopping mall, grocery store major event... often sitting beside a brand new car... selling lottery tickets that give you the chance to win a new car or some other prizes. But, as everyone knows, it gives everyone a chance to support one of the world's largest Catholic fraternal organization that does so much in supporting charitable causes and supporting the Church. There isn't a parish that doesn't feel blessed to have a local council of the Knights associated with their parish. To do all that they do, the Knights need and raise large amounts of funds - very often by the small donations of people that recognize the great good that they do. For the purchase of lottery tickets - a few loonies - the activity of the Knights can grow throughout the farthest reaches of the province. The early bird draw is really an opportunity to check how the ICCD effort is going and to give an incentive for the ticket sellers to stay the course. A banquet event is organized to which the local ICCD representative from each council is invited as well as the Grand Knight and others and their spouses. In the course of the evening a report is given as to where the effort stands and words of thanks and encouragement are expressed by the Order's leadership. Some of those that spoke at the dinner were Past State Deputy Karl Brosch, ICCD Co--Chair on the State Council level, State Deputy Dan Shepherd, State Chaplain Fr. Michael Kwiatkowski and others. The Knights of Columbus of Saint-Joseph Council 11006 hosted an amazing evening with an excellent cocktail hour and meal (prepared by the same people that host their famous fall supper). The hospitality was warm and everyone felt welcome and enjoyed themselves. We hope that the ICCD effort will meet and surpass its goals for this year.